In today's cutthroat business environment, leaders are expected to do more with less. Bottom lines are on the increase; available resources on the decrease. Worse, managers must achieve these grand goals while keeping morale at an all-time high. This isn't just a trend. It's the state of business today. And really, it's nothing new. In ancient Egypt, the Israelite slaves were forced to make more bricks with less straw. With fewer and fewer resources, the Israelites had to find ways to meet higher and higher demands. 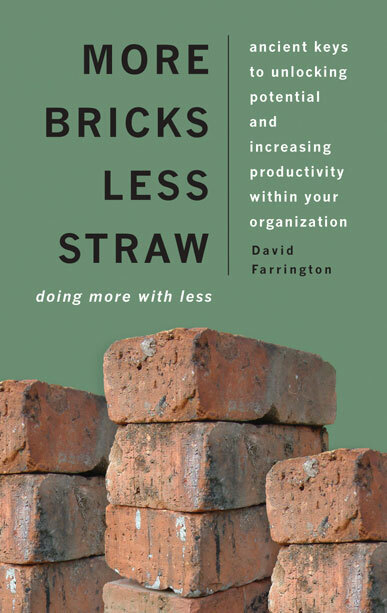 David Farrington transports this and other familiar Bible stories into the modern workplace, demonstrating timetested solutions—delegation of authority, effective communication, consensus building, and more—for today's time-pressed business leaders. As a veteran of consulting for Fortune 500 companies, Farrington knows how to produce more effective business leaders. His penetrating insights give leaders innovative strategies for building morale and creating a positive work environment, making the most of workers' efforts in a way that is beneficial to you, your team, and your entire organization. David Farrington founded his own consulting company after twelve years of full time of internal and external consulting for various companies and business sectors. He has been leading teams and training other leaders for 17 years. His consulting experiences include work for companies such as Delta Air Lines, 3M, Southern Company, The Coca Cola Company, Nielsen Media Research and American Airlines.